The whole perspective was changed when I was invited for a Bloggers meet at Ramco Systems. I was at Ramco Systems for 2 hours and I would say it was completely a fun time. I had no feeling of being in an IT company. As long as the work is completed on time, employees are allowed to have fun. You do not need to go anywhere outside to have fun. Everything is there at the office itself to keep you entertained. 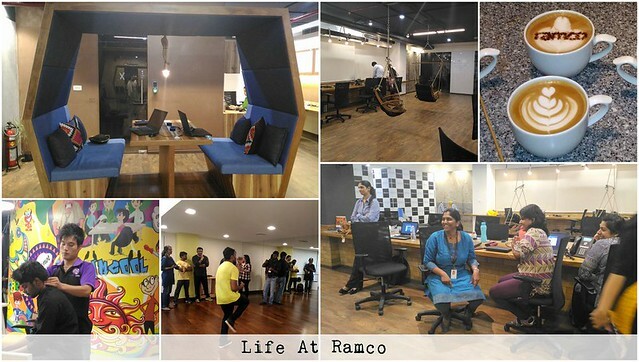 Here are some of the highlights of Life At Ramco. Of course, you will be going to the office to work for getting paid. Apart from that, here are some interesting things that you can expect from Ramco Systems. 1. You can work from any place. 3. You can get a 15 minutes massage in the office itself. They have a tie-up with Naturals for this purpose. 4. Get time for fitness at the office with Zumba, cross training, and similar programs. 5. You can play your favorite musical instruments with a cup of coffee. 6. Go for boxing, table tennis or have fun with foosball anytime. 7. Get access to healthy snacks like Ragi Crunchies. It was evident that they work hard to delight their employees. I am sure that you can expect a funny and thoughtful workplace at Ramco Systems.